It’s a marvelous day to have a wedding at the one and only “Hell’s Kitchen.” A perfect day like that deserves some less than stellar cooking from chefs that should know better. Not even a day at Las Vegas can fix that. This episode began with the chefs getting a bit too tipsy. Ariel, in particular, was really out of it so much that she tripped and hurt her foot. This would become important later on. The next day, the chefs saw that the dining room was arranged in a way for a wedding. 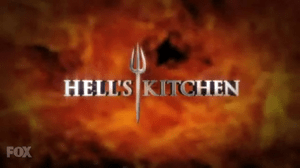 Yup, yet another person had their wedding at “Hell’s Kitchen.” This time, it was “Hell’s Kitchen” sous chef Andi, which explains her absence this season. The chefs’ challenge was each team to make two seafood appetizers, two chicken entrees and two beef entrees. Andi and her husband would choose three that would be served at their wedding. Ariel made stuffed squid, Kristin made shrimp tempura, Chad made pasta and prawns, Joe made seafood chowder and stuffed chicken breast, Ashley made pan-fried chicken breast, Jackie made roasted chicken leg but changed to breast after Ramsay told her to, Frank made chicken francaise, Dannie made beef fillet, Jarred made veal chop, Hassan made rib eye and Manda made surf and turf with rib eye. Frank did not trust that Manda would make a decent dish, so he decided to also make a steak Diane. Ramsay was confused as to why the Blue Team had seven dishes and the Blue Team was forced to get rid of one. Frank stepped in and put his steak Diane in instead of Manda’s ribeye. This backfired as both of Frank’s dishes were not liked. Besides that, the Blue Team won 2-1. Their reward was a day in Las Vegas. That’s right, this episode was the start of the grand rewards. First it was zip lining at the “Rio Casino” and a night at a presidential suite. The Red Team spent the day making macaroons. It was here that Ariel’s leg was starting to really hurt. After a visit to the emergency room, it was found out that she broke her fifth metatarsal and is now wearing a constrictor boot. Good thing it wasn’t serious enough for her to leave the competition. You would think that because the chefs were cooking for one of Ramsay’s right-hand people that they won’t make any mistakes. There were plenty of mistakes to go around. In the Blue Joe and Chad both started things off by under seasoning a risotto and overcooking scallops. Its’ the seventh episode and there are still overcooked scallops? At entrees, Jarred made a pink chicken. This chicken was also for Andi’s table. Chad evened things out by making a raw salmon. In the Red Jackie started by making one and a half portions of risotto instead of two. In one of the biggest rookie mistakes any chef can make, Dannie cooked scallops in a regular pan instead of a non-stick one. Obviously, the scallops got stuck to the pan. At entrees, Hassan made raw, not even pink, raw chicken for Andi’s table. He would make another raw chicken. To make things worse, Ramsay decided to only serve half of Andi’s table. That is embarrassing. Both teams may have finished service, but there was no winner because Ramsay was too embarrassed in front of Andi. Even if Andi knows how “Hell’s Kitchen” is, that was still embarrassing. The chefs put up for elimination were Dannie, Hassan, Chad and Jarred with Hassan getting eliminated. Hassan had a lot of potential. He was vocal, a great cook and leader. It was a shame that he fell so far in these past few episodes. Even though both teams are doing better, there are still some weak chefs on both teams. One positive is that the drama is so far kept at a decent level.